Prior to 2010, I had a vague sense of age-darkened, monstrous, and musty works hanging in the great hall of Hampton Court, and of precious bits of embroidery from Bayeux. 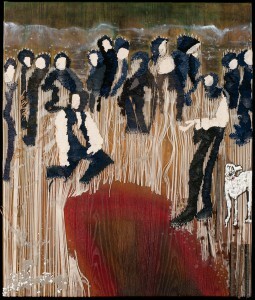 In contemporary context, I had seen tapestries that mimicked photography or painting or historical tapestries. 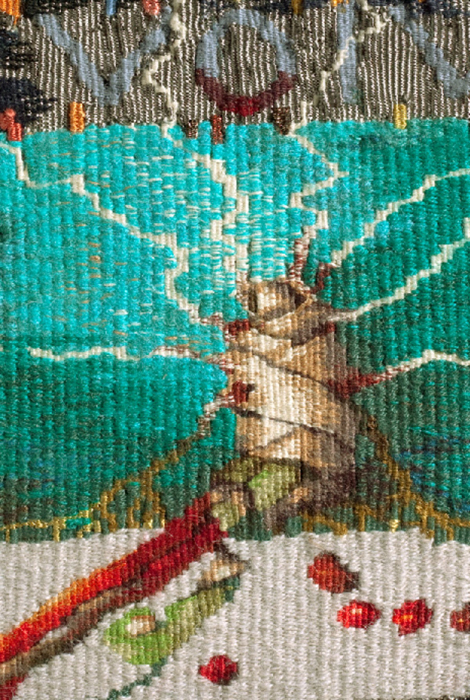 Then, in the fall of 2010, Canadian tapestry artist and instructor Jane Kidd showed me that the tapestry loom is not a machine for image reproduction in which the medium disappears. 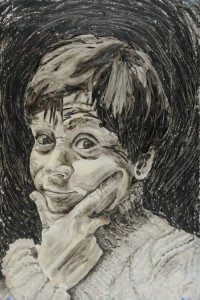 It is a vehicle for communicating meaning through both image and medium. 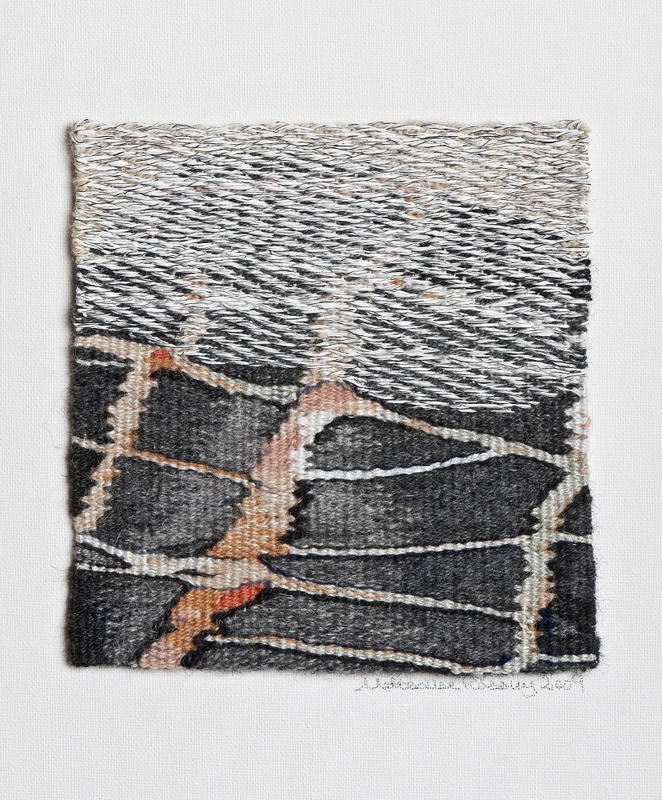 The simple weaving process, the rock solid yet unseen warp, and the deliberately truncated strands of weft are as much a part of the finished work as the image. And so, for the past three years I have been exploring from there. Now my work is a collage of process. 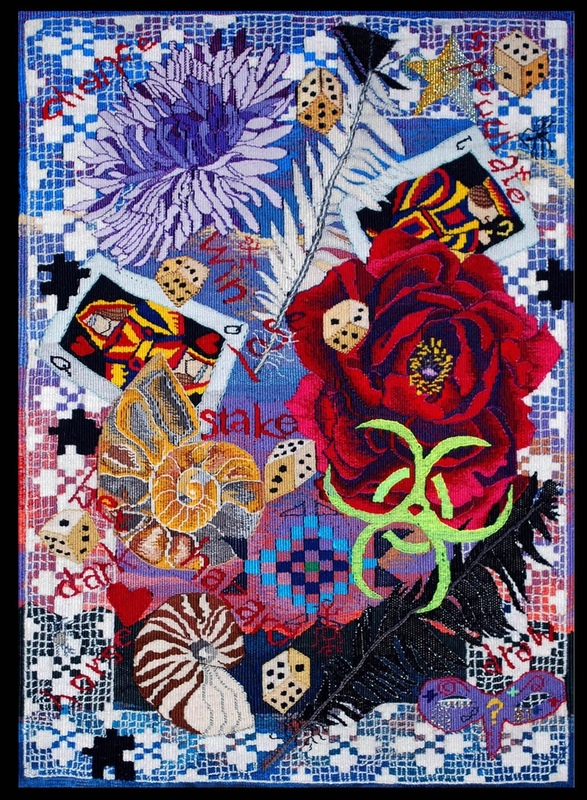 I incorporate tapestry with weaving, embroidery, wood panels, oil and encaustic paints, and found objects. No shrinking violet, the strength of the tapestry medium lends a unique and strong voice to this collaged chorus. 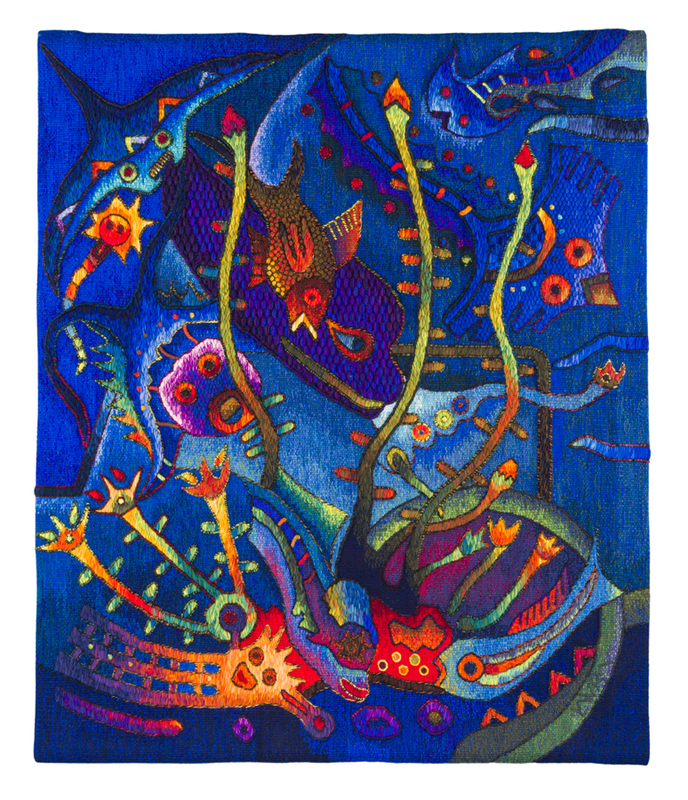 Sometimes the anchor, sometimes the backbone, sometimes the center of attention, it is my intent to integrate tapestry into my larger works and installations. 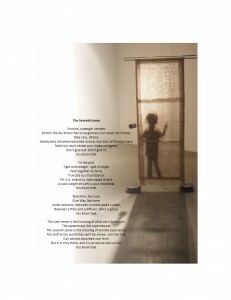 “The Seventh Sense” is an installation of woolen tapestry, linen lace, embroidered window screen, and gym weights. However, it is the text in the installation that most importantly connects the head, hands, and heart. This is one piece from a series called Sunday:2PM. Too late to start something new, too early to call it a day, this is a time of coasting, of waiting, of status quo. Yet it is not a time of stasis or repose; more like a time of ongoing process playing itself out. Sunday:2PM is at once a specific but ambiguous feeling: still, but alive; reaching outward but holding back; unexplainable but truly real. I want the works in the series to suggest moods at a specific time, but one that could belong in any day, any week, any year, or any life. A second example is the series Ex Kathedra, or “from the seat of authority.” By authority I mean all the “things” that have been passed down to me by humans that have gone before me. And by things I mean rules, traditions, freedoms, restrictions, and habits – a litany of layers. Referencing icons of Canadiana (The Red Canoe) and European art (Burial at Onans), I use materials and processes as vehicles to glimpse complex layers of context. They are layers that I must peer through in order to at least partially examine my own life. 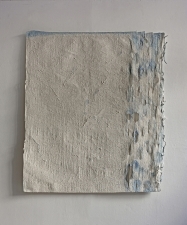 “Onans” is one work in the series in which each piece is a slightly different collage of process. 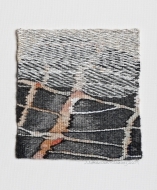 “Onans” incorporates wool on seine twine tapestry that is stitched through a dyed oak panel. Encaustic paints bind the warp threads and local dried grasses to the panel; each element lends its own strong and separate voice to the chorus. 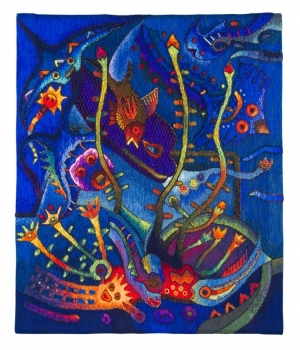 I look for each process to add its own layer of translation and mediation. The chorus in “Onans” speaks of a weighty and grounded final resting place. Yet the textile nature of the tapestry voice floats above the solid void of dyed oak panel. The fragile interwoven human community literally hangs by threads above the void of the oak panel grave. The warp threads tie the humans to each other, even as they also bind them to the plants/animals of the natural world, and the rusty reinforcing steel of human creation. “Onans” examines the human community’s fragile defenses against inevitable mortality. “HighNoon” is another work from this series. It incorporates oil and encaustic paints, dyed and inked mahogany panel, waxed linen and a tapestry of nylon netting; each lending its own strong and separate voice to this different chorus. This is another recombination of processes, where again I look for each to add its own layer of translation and mediation. “HighNoon” is a weighty but delicate balance; a tipping point with consequences. 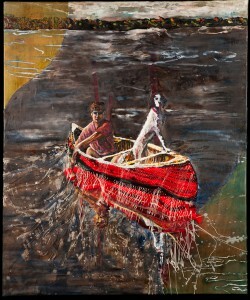 The red canoe is woven carefully, but not infallibly, into a vessel for negotiating a world, that can go from strong and serene to capsized and soaked in the blink of an eye. Tapestry has a solid, if not central, place in my practice. I expect it is here to stay. 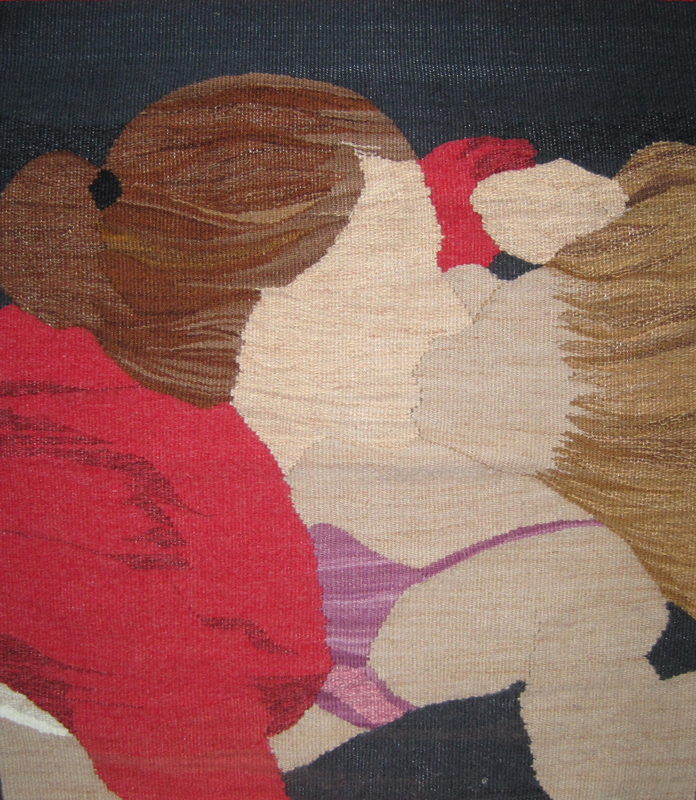 The speed of weaving tapestry fits very well with the contemplative speed of the other processes in my collage work and it is precisely for this sense of deeper contemplation that I use these slow processes. Mass instant consumption of current media culture will surely pass this work without ever noticing it. So what? I view my work as a person to person communication, not a broadcast. And despite the mass media’s self-aggrandizement, there are still non-virtual, what do call them, oh, “real” people out there. Although I am just getting started in the world beyond art school, I think personal interaction holds the best potential for impact with the tapestry medium. I look forward to participating in exhibitions, workshops, and conferences within the global tapestry community.